It’s a little like High School Musical. Thursday night, Lipscomb men’s basketball takes on Texas in the NIT championship at Madison Square Garden (MSG) in New York City. But back on campus in Nashville, students are also gearing up for opening night of Singarama, a song-and-dance competition that’s been going on for decades. 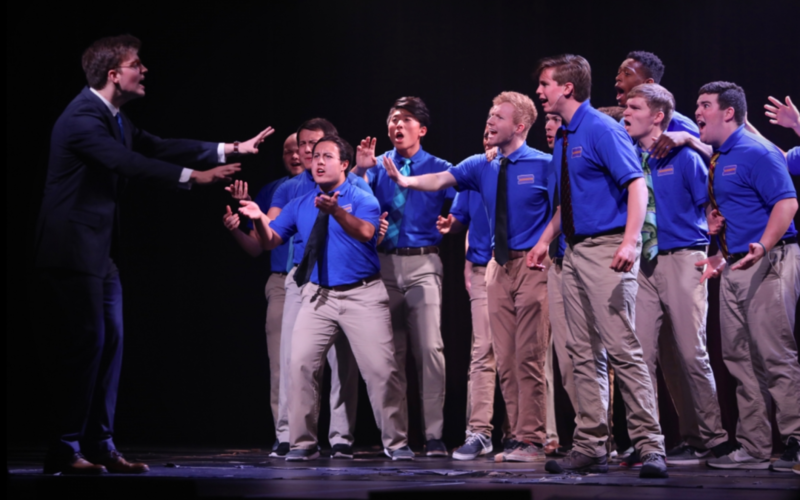 A large chunk of Lipscomb students participate in Singarama, especially those in Greek Life. And while some students are taking advantage of the bus Lipscomb sponsored to MSG, students who are in Singarama are preparing for opening night of the anticipated show. 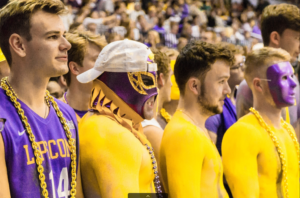 Luke Shoulders (second from left in featured photo) is possibly one of Lipscomb basketball’s biggest fans. He’s been dedicated to dressing out and cheering on the Bisons all season. But he’s also heavily involved in Singarama and has a main role in this year’s show, playing “Dad (Jim Foster)” in the “Wonder Years” show, so he won’t be making the biggest trip of the season to watch Lipscomb play in the championship. Singarama opens on Thursday night and has a show on Friday evening and two shows on Saturday. The Thursday night show was pushed back to 8 p.m. to allow students to watch at least some of the game. While he said he’s grateful Lipscomb pushed the show back to 8 p.m., Shoulders said the ideal situation for him would have been if the Thursday show had been moved to Sunday evening. However, Shoulders added that it’s probably for the best that he go ahead and do the show on Thursday. Ultimately, he said he’s still very excited to go out on stage and perform. But student Lindsay Bradshaw is on the opposite side of Shoulders. 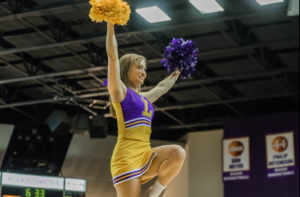 She’s a cheerleader for the basketball team and will be cheering for the Bisons in MSG on Thursday night instead of making it back to campus for Singarama’s opening night. She may be the “Troy Bolton” in the whole High School Musical (or “College Musical” is a more appropriate name for it), as she still plans to make it back in time for Friday and Saturday’s shows to perform. Bradshaw said that although she’s sad about missing Singarama, she is more excited to cheer for her team. She added that she’s looking forward to seeing the Lipscomb community gather together tomorrow in two big ways — for basketball and for Singarama.